Animal tissues. Connective tissue proper. Atlas of Plant and Animal Histology. Connective tissue proper contains several types of cells and a variable amount of extracellular matrix ☆. This tissue is widespread throughout the body. It fills spaces between organs, for example between the skin and muscles, and surrounds blood vessels, nerves and several organs. It is also the stroma of organs such as kidney, liver, glands, gonads, and some others. The typical cells of connective proper are fibroblasts. Synthesizing most of the molecules that constitute the extracellular matrix is their main function. At light microscopy, fibroblasts are elongated cells, more or less fusiforms, with one ovoid nucleus containing one or two nucleoli, and small amount of cytoplasm☆. Other cells, such as reticular and mesenchymal cells, can be found in particular subtypes of connective tissue proper (see below). Fibroblasts are regarded as resident cells because they are only found in connective tissues. Other cells found in connective proper tissue are originated in the bone marrow and reach connective tissues after crossing the endothelium of blood vessels. These non resident cells are mast cells, macrophages, plasmatic cells and the different types of leukocytes, which are intermingled with fibroblasts. All these cells are involved in immune functions and are able to move through the extracellular matrix. The amount of non resident cells is variable depending on the location and the local conditions. Adipocytes are also present in connective tissue proper. Gelatinous connective from the umbilical cord. Mucous (also know as gelatinous) connective contains a low number of cells and scarce amount of collagen, but a high proportion of ground substance where proteoglycans are abundant, particularly hyaluronic acid. These features allow mucous connective tissue to be turgid and resistant to stretching. Mesenchymal connective tissue from chick embryo. Mesenchymal connective tissue is composed of undifferentiated cells and loose extracellular matrix. During embryonic development, most of the connective tissues are differentiated from mesenchymal connective tissue. Reticular connective tissue of the spleen. Reticular connective tissue is formed by reticular cells, which are different from the common fibroblasts. This tissue is found in the bone marrow and lymphoid organs. Long and thin fibers referred as reticular fibers can be observed in the extracellular matrix. Loose connective tissue showing elastin fibers. Loose connective tissue of intestinal mucosa. Areolar or loose connective tissue shows a broad distribution since it can be found almost in every organ of the body. It occupies regions which are not under strong mechanical forces, and contains disperse fibers distributed through the extracellular matrix, which are not strongly stained by common dyes. This tissue plays a central role in feeding other tissues and organs because nutrients diffuse easily through extracellular matrix. It is not a specialized tissue. Dense connective tissue is particularly abundant in the lamina propria of hollow organs, such as gut and pulmonary ducts, as well as in the dermis. This type of connective tissue contains a higher proportion of fibers when compared to ground components and fibroblasts. Regarding the fibers and fibroblasts organization, dense connective tissue is classified in two subtypes. Dense irregular connective tissue of the skin. 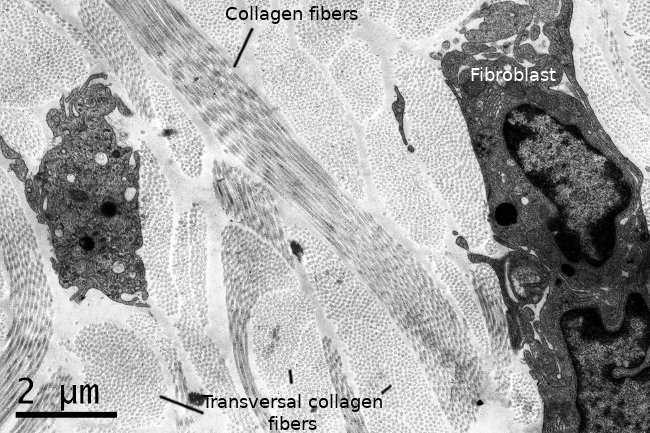 Dense irregular connective tissue has large amounts of collagen fibers grouped in bundles, which form a tridimensional network. The collagen fibers are thicker than those in the loose connective tissue. This tissue is located in the dermis and in capsules around organs. Dense regular connective tissue from a tendon. Dense regular connective tissue contains a large amount of collagen fibers in the extracellular matrix arranged in parallel bundles or sheets. This reflects mechanical needs and actually this tissue is found in structures under unidirectional mechanical stress, such as tendons, ligaments, and sheaths or fascias surrounding skeletal muscles.